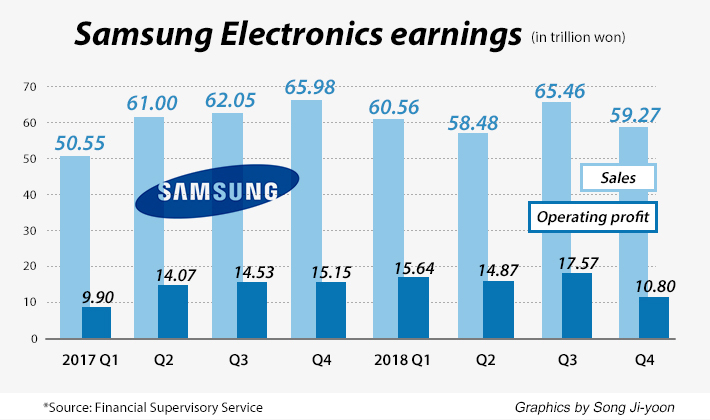 Confirming the chip segment’s slip into a bust stage after a two-year boom in the near 40-percent fall in fourth-quarter earnings, Samsung Electronics won’t carry out a big-scale capacity expansion and investment this year after a 32-percent scale-down in capital investment last year. “This year, we’ll focus on optimizing all chip-making lines for flexible capacity management to better meet the customer demand,” said Lee Myung-jin, vice president in a conference call Thursday after the release of final fourth-quarter and full 2018 income statement. The world’s largest chipmaker confirmed an operating profit of 10.8 trillion won ($9.8 billion) in the October-December period, down 38.6 percent from the historic level of 17.57 trillion won in earlier three-month period and 28.7 percent against a year ago, delivering its worst performance since the first quarter of 2017. 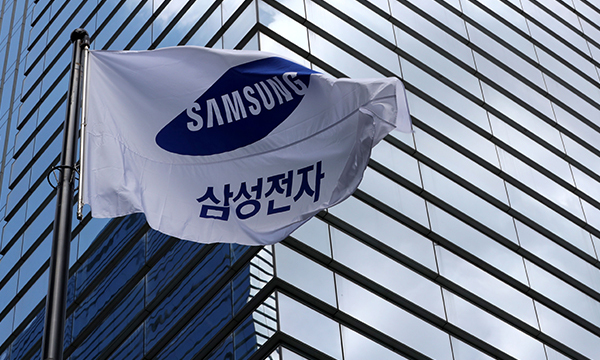 Samsung Electronics shares Thursday closed 0.54 percent lower at 46,150 won in Seoul. Net profit in the fourth quarter plunged 35.7 percent on quarter and 31 percent on year to 8.5 trillion won during the period. Sales were off 9.5 percent on quarter and 10.2 percent on year to total 59.3 trillion won. Its chip sector delivered 7.77 trillion won in profit and 18.75 trillion won in revenue in the final quarter, the poorest results since the first quarter of 2017. The company maintained a dismal outlook for the ongoing quarter. “Key (chip) clients continue to use up inventories (instead of making new orders) in the first quarter, a traditional slow season. The weakening in demand will continue,” the company said in a statement. “Demand will pick up in the second quarter with high-performance and high-quality memories for 5G and artificial intelligence-based chipsets,” Lee added. The company said capex will decrease from last year’s spending of 29.4 trillion won in facility investment that came significantly down from all-time high 43.4 trillion won in 2017. It invested about 23.7 trillion won for chip-making business and the rest for display sector. It plans to specify the spending plans once they are confirmed. Non-chip segments failed to pose as a relief to the chip setback. Smartphone division remained weak as sales were down during the peak season. It hopes its new 10th anniversary flagship model Galaxy S10, which will be launched next month and follow-up foldable handset, would bring traction to the stagnant division. The operating profit inched down 0.7 percent on quarter to 1.51 trillion won. Sales dropped 6 percent to 23.32 trillion won. In displays, the company raked in an operating profit of 0.97 trillion won, down 0.1 percent on quarter, due to deteriorated profitability of OLED panels. Sales fell 9 percent to 9.17 trillion won. Consumer electronics business reported small improvements, earning 0.68 trillion won in operating profit on revenue of 11.79 trillion won. 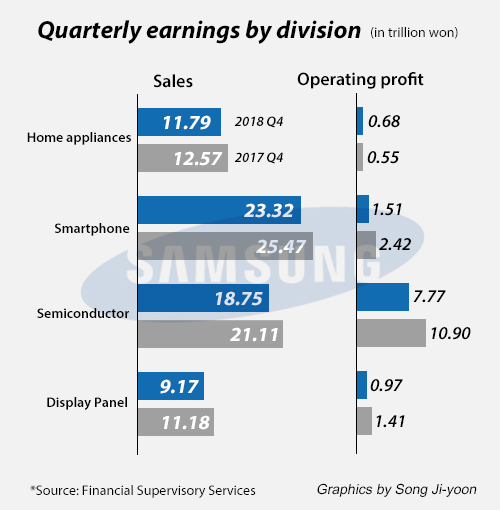 For the full 2018, operating profit gained 9.8 percent from the previous year to hit an all-time high of 58.9 trillion won, of which 44.6 trillion won came from selling chips. Net profit stretched 5.1 percent to 44.3 trillion won, and revenue added 1.8 percent to 243.8 trillion won. As part of efforts to indulge anxious investors, the company announced a cash dividend payout plan worth 2.4 trillion won.